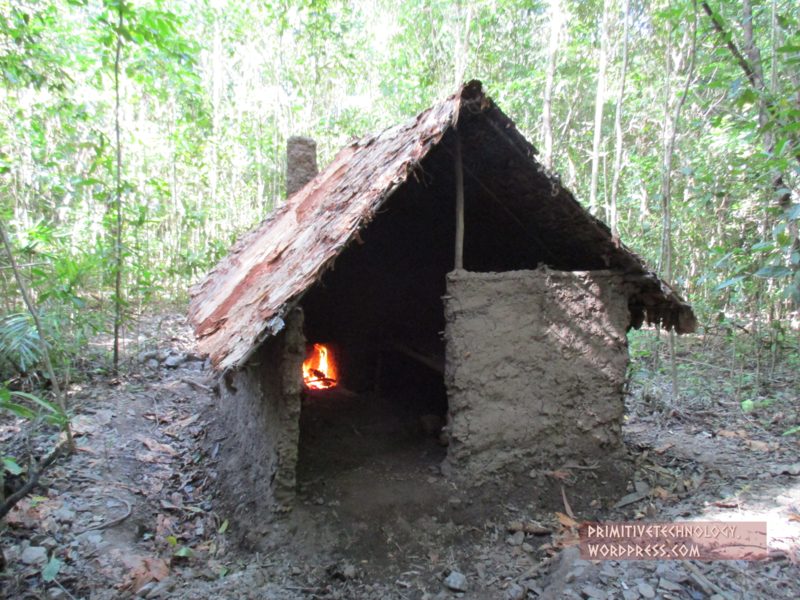 I built this hut in the bush using naturally occurring materials and primitive tools. The hut is 2m wide and 2m long, the side walls are 1m high and the ridge line (highest point) is 2m high giving a roof angle of 45 degrees. A bed was built inside and it takes up a little less than half the hut. The tools used were a stone hand axe to chop wood, fire sticks to make fire, a digging stick for digging and clay pots to carry water. 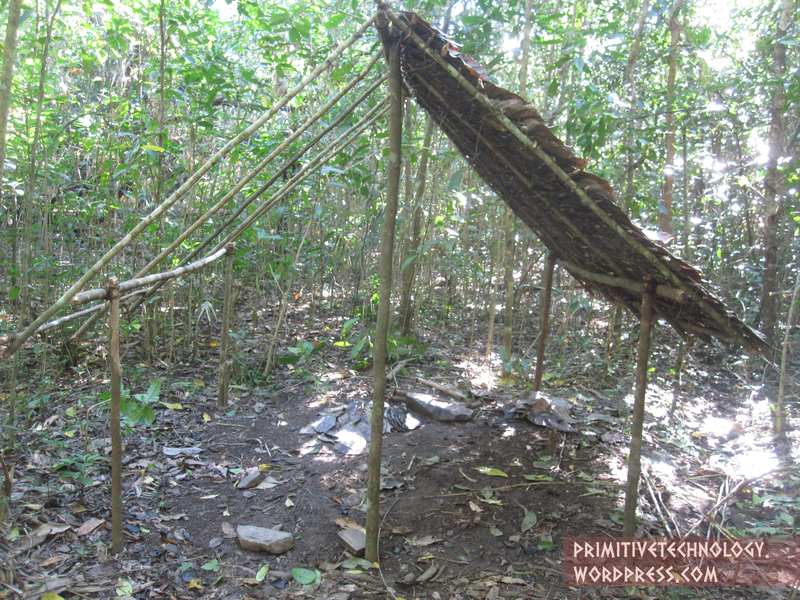 The materials used in the hut were wood for the frame, vine and lawyer cane for lashings and mud for daubing. Broad leaves were initially used as thatch which worked well for about four months before starting to rot. 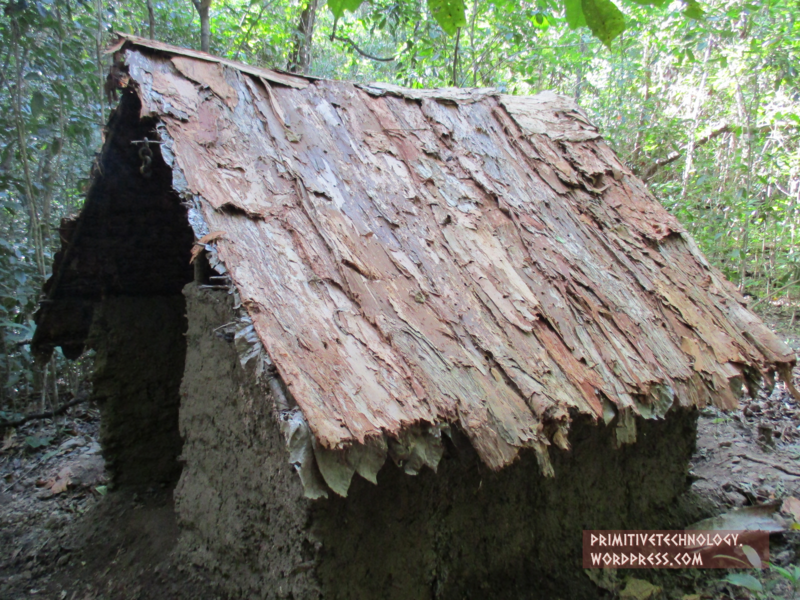 The roof was then covered with sheets of paper bark which proved to be a better roofing material. An external fireplace and chimney were also built to reduce smoke inside. The hut is a small yet comfortable shelter and provides room to store tools and materials out of the weather. The whole hut took 9 months from start to finish. But it only took 30 days of actual work (I abandoned it for a few months before adding bark roof, chimney and extra daub ). Thank you so much for sharing your talent and knowledge with us. If I ever get stranded in a forest, this may save my life. I have a question. What do you eat usually? It would be great to see if you have any special methods for acquiring food. I don’t actually live in the wild- I just eat modern food most of the time. Though I’m looking into growing food in the bush and that might be a new video I hope to make. Thanks. you are the coolest guy ever and I built the wattle and daub hut with some friends in two days. Works amazingly! you should make more videos. Congradulations for the work, its awesome! I’m wondering: where you did it? in a rural zone, native area or what? It’s an abandoned cane farm- That’s why the trees are so straight. Eventually yes I will explore other themes but these are important for higher technology. Thanks. It appeared as though you were mixing some kind of fibrous material into the clay that you used for making the pots. Could you explain what you were doing and why? It was crushed up dry leaves. The fibers give the clay a little tensile strength so that as the pot drys it is less likely to crack. Also when fired, it leaves tiny tunnels for the steam to escape so the pot is less likely to explode. Thanks. You have Inspired me to build a Hut! I want to set out and work on my project everyday after work or on weedends. I love in South East Australia , in Logan. Where do you go to do your projects and how do you get the councils approval to cut down trees and make fires in a forest? Or do you do the stealthy, and never get caught? Thanks Josh. This is on an abandoned cane farm in FNQ. I’d advise you find someone who own property in the bush and go there. Not sure about camping laws down there but pay attention to fire bans when it become to dry. Thanks. No. Australia. I read that comment but no- I just built it as a hobby. I did find a bee hive and kept it like in the poem though. Life imitating art? Thanks. Hi there, are you studying architecture…or archaeology? If not, what are you studying? Ps. The country I live in, South Africa, has masses of hand axes and other primitive hand tools that were used by the inhabitants 1000ds of years ago. Hi Leonard. I have studied at university but finished years ago. I did chemistry, biology, earth science. Thanks. Sorry if i you answer to this question before but how you get interested on this hobbie? I just built huts since I was a kid. Living near the bush I suppose. Thanks. It’s very nice to see these huts, I loved to watch the videos! Thanks Ness. It’s been reported and should be down soon. Glad you liked the videos. Much appreciated. Fabulous, what a weblog it is! This web site provides valuable facts to us, keep it up. Thanks Arduino. I try to keep the writing style simple and straightforward so others can replicate it. True science. BTW, I like your not using any music with the video. The natural ambiance is relaxing, and hearing the sounds that objects make is very important. It was a pleasure to find your blog. Respect. I agree. Adding music and narration is unnecessary. Thanks. Hi, I am just wondering if you are married? Awesome videos! This method of building was used in my country in Central America. No. This method is quite often used in many countries. Thanks. Your videos are excellent! I live in the states and when I was younger, I spent as great deal of time building forts like the ones you build. Despite the huge distances, I’m amazed how similar the techniques are. Your structures are far better then mine, however. Have you considered doing a series of videos smelting iron or making steel? You have the kiln/fire pit thing down to a science! Thanks Vince. I’ll do it some day. This is awesome stuff. I built one of these huts (wattle and daub) here on a small island on a river here in New Hampshire, USA in two days with the help of my friends. It inspired me to build a bigger one at home, which was two stories. Built it with some friends in a week, but after a while the wood rotted and when I was walking in the top floor it fell and I fell on some sharp broken sticks. Now in hospital! Thanks. It was a great experience building these huts and I don’t regret building it. I may be here a couple weeks. Just an announcement to all the people that, though single story ones are great and all, do not try and make two story ones! That’s no good. Hope you get better soon Andy. Thanks. Do you know the fastest possible time it would take to construct the wattle and daub hut? My friends and I are going on an annual wilderness survival boy scout camp out and we wanted to construct this hut so we don’t have to make a shelter the next year. We have a day to construct shelters so time is limited. Thanks! A day won’t be enough time. Thanks. They embedded the video though, so when people watch it they are directed to my channel. But thanks for letting me know and let me know if you see anything else. Much appreciated. How big is your forest that you bought? I guess its big and you got lots of land in Australia.